In the UK Guardian yesterday. What a nutter that man must have been. It is a shame she expected anything more than the diatribe she received - though, we should expect more regardless. But this is how our parents seem to cover up for poor parenting and abuses of the past. Repentance and apology always flows from the younger to the older, never the other way. The framework of Nigerian society is such that the older or elder never lies, even if that lie is ever so obvious, it is never the done thing to accuse elders of wrong-doing. The only way to get that across to adopt proverbs and double-talk then also you have to defer and apologise for not speaking straight. Patriarchalism excerbating parochialism is the bane of our society. Then we are made to feel powerless by postulations of piety, godliness and perfection. How better to conquer undeserved moral ground without due regard to the hurts they have caused us but by professing a "holier than thou" image? When that comes from a long lost parent, we are almost too polite to shut them up and make them face the real facts of the matter. King Solomon was the second child of a relationship that started illegitimately - he turned out to be the wisest and richest king ever - because his father David acknowledged his "sin", repented and exercised the true office of a loving father. If only our so godly parents would learn those lessons for themselves than try to cover their misdeeds by trying to preach their faults out of us. I despair, sometimes and I am saddened by this episode. Shows how dangerous and brain damaging religion can be when taken to its extreme. The irony is he committed the so called sin by leaving his child only to claim that she was in fact the sin since he bacme a god fearing man. Ridiculous. He clearly believes what he is saying is true. Fortunately for her she had the good sense to see it. Others have been unlucky to have this kind of beliefs forced down their throats from day 1. But that’s not to say any body wanting to believe in any god should not. But it’s actually sinful and de-humanising to force your beliefs on somebody else. When u put it in the context of basing wars around it, it becomes even more frightening to cause mass destruction in the name of so called religion. How can he think that even if she accepted Christ, no one will ever see through the obvious that he committed the sin? Just because he's born again, how does that detract from the fact: “he abandoned her”. What an absolutely fantastic story. Very well told, too. 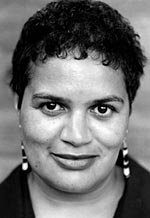 As an "out-and-out brutal atheist" myself, I think I'm going to hunt down Jackie Kay's books. And the fact that she's so comfortable in her sexual identity is icing on the cake. She's the light for the future, and the perfect answer to all the nutters.